GTI International returns to Shakespeare County Raceway near Stratford upon Avon This Weekend 9th-10th July. It's the biggest event of the year for GTI enthusiasts and lovers of everything quick from VAG. It also represents the 40th Anniverary of the VW Golf GTI: the car that started it all. To celebrat this, what is believed to be the first RHD Golf GTI ever built will be on show. Naturally, Golf GTI MkIs will be joined by all the other generations, up to the latest Golf GTI Mk VII. As usual there will be 'run what you brung' VW drag racing, open to every visitor. And this year an ambitious attempt to make a giant ‘GTI’ logo using show-goers’ own Golf GTIs. The plan is to line the cars up, then take aerial pictures of the ‘Big GTI’, and the cars’ owners, from a microlight aircraft. More than 200 avid Golf GTI enthusiasts have pledged their cars to the ‘Big GTI’ cause, which will take place at noon on Sunday. All VW driving visitors to GTI International are invited to run their VWs on the famous Shakespeare County Raceway 1/4 mile drag strip, supervised by an expert team of experienced marshals. You can get the max out of your car against professional timing equipment and in front of 3,000 spectators with no fear of prosecution. Always popular at GTI International is the Show ‘n’ Shine/Concourse, where more than 200 showroom-condition Volkswagens will be on display. Most of these have been modified or customised, and entries have once again poured in from all over Europe. More than 40 Volkswagen clubs will be in attendance, and there will be numerous trade stands giving Volkswagen aficionados the chance to buy all the aftermarket accessories they need for their car. 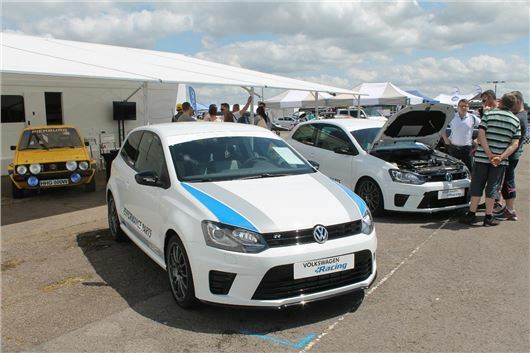 With live music and camping on offer, not to mention an early weather forecast that promises warm temperatures, the 2016 GTI International show looks set to be another big hit.